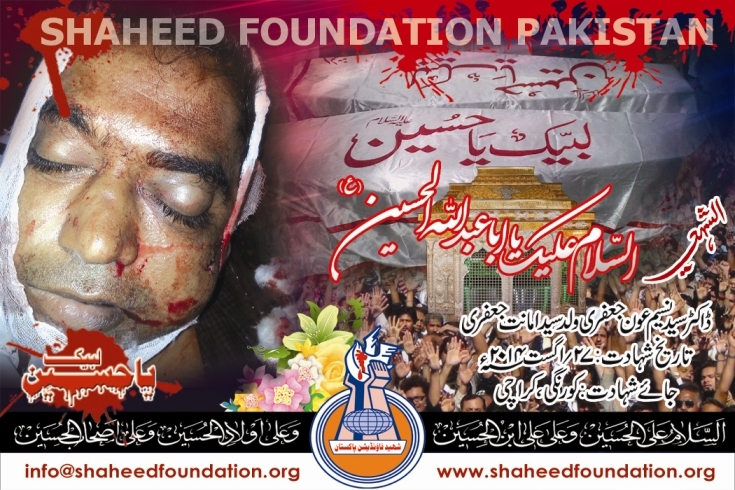 Dr. Syed Naseem Aun Jaffri s/o Syed Amanat Jaffri embraced martyrdom when terrorist open fire on him. The incident occurred on Javed Clinic near Hussaini Imam Bargah, Korangi 5.5. He was 45years old. Namaz-e-Janaza will be offered after Namaz-e-Zohrain in Hussaini Imambargha Korangi, while Tadfeen will be in Wadi-e-Hussain. Please recite a fateha for Shaheed Dr. Naseem Aun and Shohada-e-Millat-e-Jaffaria Pakistan.